Mr. Stephen Wallace is Systems Innovation Scientist for the Emerging Technologies (EM) Directorate at the Defense Information Systems Agency (DISA). Wallace focuses on delivering innovative processes, services, and capabilities across the agency. The EM Directorate develops, executes, prioritizes, and collaborates EM-based needs such as browser isolation, Software Defined Networking and Assured Identity. Previously, Mr. Wallace served as the Technical Director of DISA’s Development and Business Center. 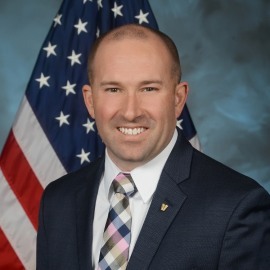 In this role, he worked on integrating commercial and government-owned technologies in support of the Agency’s emerging technologies, such as Software Defined Networking and Assured Identity. Wallace’s other former roles within DISA include Chief of Cyber Innovation and chief engineer for DoD Enterprise Email. Prior to joining DISA, Mr. Wallace was an employee of Computer Sciences Corporation as a government contractor. During this time he worked to build a variety of enterprise class collaboration, identity management, and authentication systems for the Federal Government. Wallace holds a Master of Science degree in Cyber Security, and a Bachelor of Science degree in Telecommunications, both from Capitol College. He holds a CISSP certification, and is a graduate of the Harvard Kennedy School Senior Executive Program.